Need a go-to salmon recipe that's full of flavour? 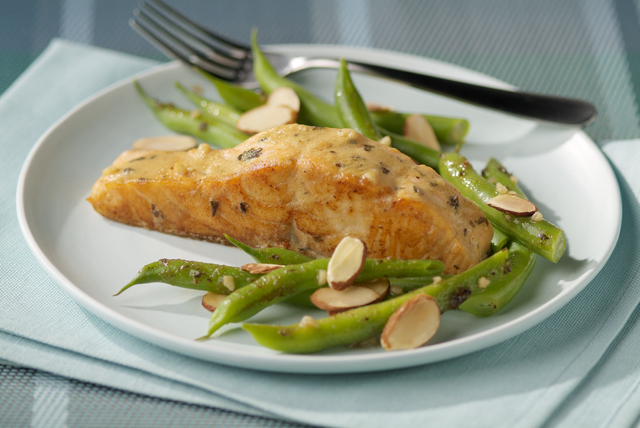 This salmon recipe with green beans amandine and balsamic vinaigrette is sure to do the trick. Place fish on rack of broiler pan sprayed with cooking spray. Mix mustard, 1 Tbsp. dressing and 1/2 tsp. garlic; spread onto fish. Broil, 4 inches from heat, 6 to 8 min. or until fish flakes easily with fork. Meanwhile, place beans in medium saucepan; add enough water to completely cover beans. Bring to boil; simmer on medium-low heat 6 min. or until beans are crisp-tender. Drain beans in colander. Add remaining dressing and garlic to saucepan; cook on medium heat 1 min., stirring occasionally. Add beans; cook 2 min., stirring occasionally. Top with nuts. Serve with fish. A good source of iron per serving, this easy-to-make dish is a great way to add more fish to your diet.